MORTON GROVE, ILL. – Jan. 22, 2018 – Xylem Inc.’s Bell & Gossett (B&G) brand is introducing its Parallel Sensorless Controller, a device that provides advanced system staging of up to eight pumps in parallel configuration to maximize system efficiency – an industry-leading offering with a large 5.7-inch touch screen that displays real-time feedback and enables energy modeling. Sensorless pump control technology relies on pump-specific algorithms, which can accurately predict where a pump operates on its curve. Using speed, torque and power data to know where the pump operates on the curve, sensorless pump controllers can be set up to take action based on those factors. 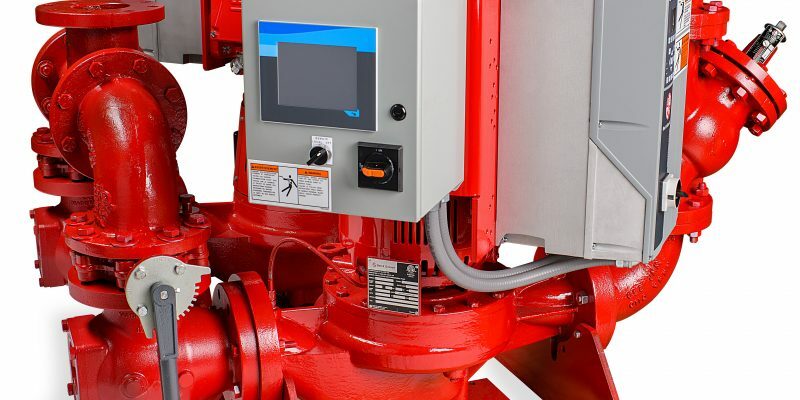 The staging and destaging multi-pump configurations that are compatible with the Parallel Sensorless Controller are created on the basis of efficiency, thus allowing optimized hydraulic efficiency. It meets ASHRAE 90.1 system efficiency requirements and features advanced system staging with B&G’s expansive Efficiency Island operating range. With the capability to run parallel configurations with up to eight pumps, B&G’s Parallel Sensorless Controller delivers the best efficiency staging to minimize energy costs and enables individual pumps to take control if one or more units or sensors are not active, ensuring reliable system flow and pressure. Unique to the B&G Parallel Sensorless Controller is the real-time graphical display of the hydraulic pump curve, system curve and control curve. This enables the user to see actual system performance to confirm and adjust optimum hydraulic performance. The graphical display is also 40 percent larger than other models, providing better visibility of system data during commissioning and service. A dedicated and integrated disconnect switch that eliminates the need to install a separate switch, reducing costs and time. For more information about Bell & Gossett’s Parallel Sensorless Controller, please visit http://bellgossett.com. Xylem (XYL) is a leading global water technology company committed to developing innovative technology solutions to the world’s water challenges. The Company’s products and services move, treat, analyze, monitor and return water to the environment in public utility, industrial, residential and commercial building services, and agricultural settings. With its October 2016 acquisition of Sensus, Xylem added smart metering, network technologies and advanced data analytics for water, gas and electric utilities to its portfolio of solutions. The combined Company’s nearly 16,000 employees bring broad applications expertise with a strong focus on identifying comprehensive, sustainable solutions. Headquartered in Rye Brook, New York, with 2015 revenue of $3.7 billion, Xylem does business in more than 150 countries through a number of market-leading product brands. The name Xylem is derived from classical Greek and is the tissue that transports water in plants, highlighting the engineering efficiency of our water-centric business by linking it with the best water transportation of all – that which occurs in nature. For more information, please visit us at www.xylem.com.